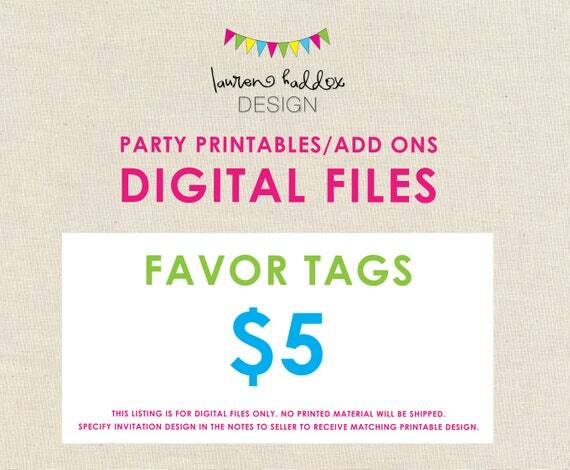 Having a party but only need the FAVOR TAG printable from a party pack? Add this listing to your shopping cart and let me know the party theme you would like from the listed party packages. Print as many favor tags as you need for your party onto 8.5"x11" bright white card stock. 1. Add this listing to your cart. 2. In the “notes to seller” section, include the party pack and text for personalization (where applicable). 3. Files will be sent to the email address listed on your Etsy account. Are you looking for a different theme??? Convo me and I’ll come up with a design perfect for your party!!! $10 design fee applies to all custom work. Lauren Haddox Designs retains the copyright to all DIY printable files. You may not redistribute this file. It is for your personal use only. If someone you know is interested in using the file, please direct them to laurenloulolly.etsy.com!